materials). Polyethylene is a thermoplastic material and consists of the organic basic substances carbon and hydrogen. Polyethylene is world-wide with a portion of approx. 29 per cent the most produced plastic. The main characteristics of polyethylene are its high tear and wet strength as well as good odour proof properties. 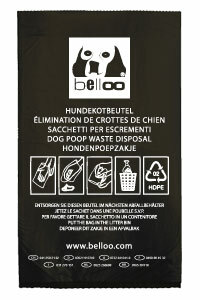 Due to these properties this plastic material is optimally suitable for its use as dog waste bags. 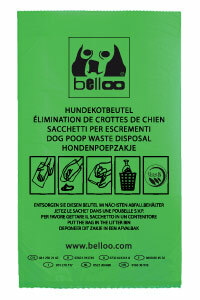 In addition, polyethylene burns completely and is environment-friendly. 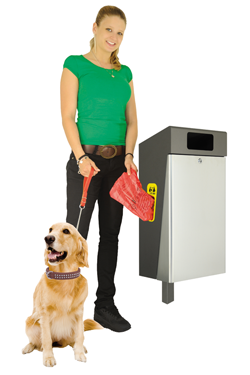 The dark brown dog waste bag is our classic model. (High Density – manufactured using the so-called low pressure technique). 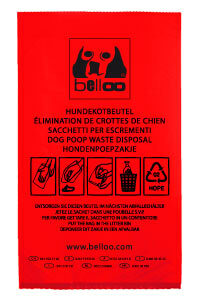 Since 2003 we also offer red belloo bags, following an idea of our product developers. 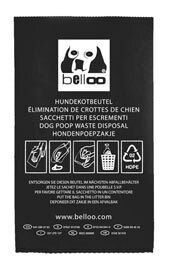 These bags offer a decisive advantage by providing an additional incentive to the user in order to dispose of the bag correctly. Red bags are very popular. The steadily increasing oil price and a growing awareness of resource conservation more and more increase the popularity of recycled products. 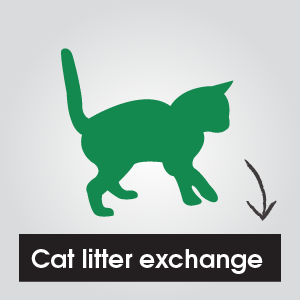 Our recycled bags consist of 80 % of used polyethylene. At production, all the environmental aspects regarding the environmental performance evaluation, are taken into account. Using recycled bags you can protect the environment and save money at the same time. Since spring 2008 the bio-bag is included in our range of goods. This bio-bag is manufactured from regrowing raw materials. Under ideal conditions, a bio-bag is fully biodegradable. Nevertheless, this bag should not be deposited in the compost but shall be transported to a refuse incineration plant. 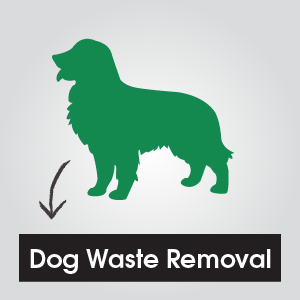 The reason is the risk of infection by dog waste.